Most of parents read fairy tales to their children and these children enjoy listening fairy tales. However, in fairy tales there are some characters which are taken as a model by children and patterns connecting with some patterns like wedding. In The Green Fairy Book, in 1982, as Lang refering to Lang to emphasises fairy tales to have fun for children but also teach them. Those characters and symbols have active roles on children's behaviour and personality. No one can say that children are not affected. Also Lieberman agree with affect of that children are socialized and effected by movies, television, and tales but and she adds we are not able to know its harm. . "Some Day My Prince Will Come." Female acculturation through the fairy tales 384. As Lieberman indicates in his article which is named "Some Day My Prince Will Come" Female acculturation through the fairy tales that these stories emphasize lots of difference features of behavioral rules. Children may learn something which is bad like trickery, may suppose something in negative way like beauty or ugliness even these stories teach children good things like a kindness thoughtfulness. WriteWork contributors. 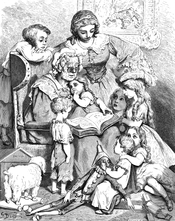 "The Effects of Fairy Tails on Children" WriteWork.com. WriteWork.com, 23 April, 2009. Web. 21 Apr. 2019.